This has been quite a rally that has caught a lot of portfolio managers by surprise. With the Stoxx 600 now firmly in overbought territory, it’s worth having a look again at the longer-term picture for positioning and valuation. According to Bank of America Merrill Lynch’s latest poll of fund managers, European equities are still the most crowded short among global assets. 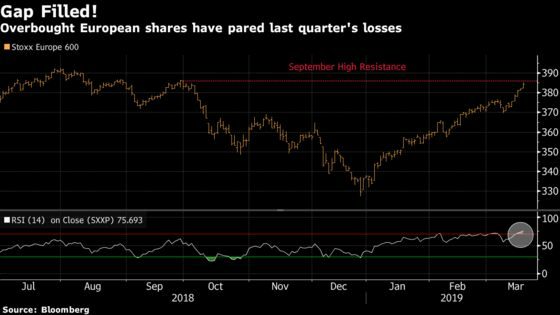 The region’s stocks have only beaten their peers in two quarters every two years, yet, given the shorts, the strategists suggest they’ll soon do it again. In terms of valuation, one thing to keep in mind is the dividend yield. Bund yields and other risk-free assets are hovering at a very low level, keeping the gap with dividends near historical highs. 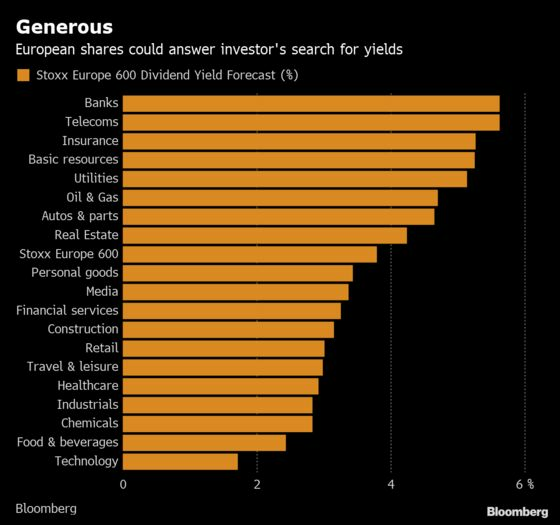 And about 80 percent of European companies have a dividend yield above their corporate bond yield. Goldman Sachs strategists are neutral to slightly bearish on European stocks, but are optimistic about dividends and payout ratios. They see the low leverage of companies supporting cash returns, while expecting a 2 percent 2019 earnings-per-share growth forecast to be enough to sustain the payouts. Ah, “but what about the dangers of value traps?” you might ask, whereby a stock appears cheap only for the shares to fall further or for the company to cut its dividend. 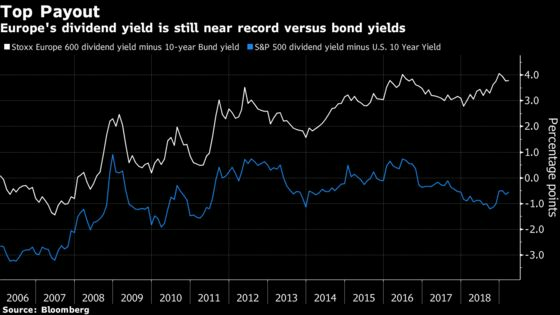 For Goldman strategists, the timing is right to play the high dividend yield that’s on offer. And Citigroup strategists share the view, citing strong balance sheets, surplus free cash flow, and high payout ratios of European shares. Sector-wise, basic resources, industrials, banks, oil & gas and insurance score best on dividend metrics, they said. They name Aviva, Deutsche Post, KBC, Lloyds and Volvo as “Dividend Kings.” Looking for dividend distortions, the strategists identify “cheap versus expensive” stocks and cite Adecco against Nestle, BNP versus Air Liquide, and Aviva versus Diageo. Ahead of the open today, Euro Stoxx 50 futures are down 0.5 percent. Watch European logistics names after U.S. delivery operator FedEx trimmed its annual profit forecast for the second time in three months, sending its shares lower in late trading. FedEx blamed the outlook cut on slowing global growth and rising costs from an acquisition made in Europe in 2016. Watch Deutsche Post, Royal Mail, Bpost, PostNL, Austrian Post and Poste Italiane. Watch satellite industry stocks after U.K. firm Inmarsat confirmed it has received a $3.3b takeover offer after the bell on Tuesday, with a 24% premium to the closing price. Watch peers including SES and Eutelsat, the latter of which weighed an offer for Inmarsat last year before eventually backing off. Watch the pound and U.K. stocks as the European Union is likely to give Theresa May until mid-April to decide whether to extend Brexit to 2020 or leave the bloc without a deal at the end of June. Yet from the pound to stocks, markets are getting optimistic. Watch trade-sensitive sectors after negotiators are concerned China is pushing back on the demands being made, reportedly because it hasn’t received assurances that the tariffs slapped on Chinese goods will be removed. The noise on the U.S.-Europe side of the trade war doesn’t sound too happy either. Watch carmakers and parts suppliers in particular after Nissan is said to cut a future target for car sales in China by around 8%. Morgan Stanley upgrades Teleperformance to overweight from equal-weight, saying the company may face some concerns longer term, but near-term gains look attractive. Within the business services sector, Morgan Stanley prefers Teleperformance, DCC, Applus, Ashtead and Hays, while it’s cautious on Bunzl, Eurofins and Experian. RBC raised Beiersdorf to outperform from sector perform, with more than a 23% increase in price target to EU100, saying the company deserves credit for step up in revenue investment.